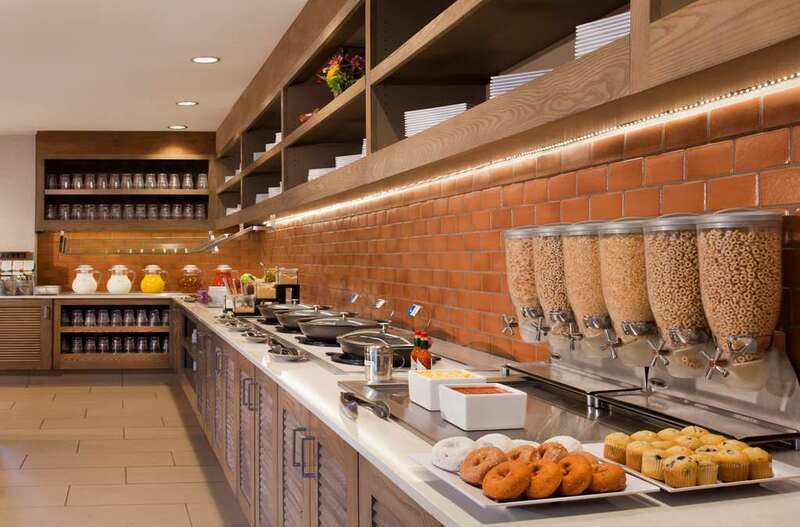 Now you can experience Hyatt hospitality at Hyatt House. Hyatt has reinvented the all-suites hotel with new design and amenities more in step with today's travelers. You'll find free high-speed Internet, complimentary full breakfast and Evening Social, plus the convenience of a full kitchen. If you enjoy getting more than you expect, make your reservation today. Welcome to more. Guests will enjoy innovative food and beverage options at the daily complimentary breakfast and the complimentary Evening Social that takes place Monday through Thursday. A Guest Market offers a variety of snacks, upscale frozen entrees and grocery items that can be used to prepare meals in your suite. Guests can also take advantage of our complimentary grocery shopping service. At Hyatt House you can stay fit and have fun at our Stay Fit Fitness Center, pool and recreational areas. Grab snacks at our 24-hour Guest Market. Or, if you want to grill on the outdoor BBQ pit, just give us your list for complimentary grocery shopping service. Plus, laundry facilities and dry cleaning service are also available. Hyatt House provides free high-speed Internet access and voicemail in its guest suites. Download documents, search websites and access email with connections that are fast, secure and reliable. Pet Policy - 1-6 nights a 75 non-refundable fee. 7-30 nights a 75 non-refundable plus a 100. cleaning fee will be administered -inclusive of taxes. Max. 2 pets per rm. Weight limit is 50 lbs or less for 1 pet or max. 75 lbs for 2 pets. Fees are in USD. Service animals are exempt from fees. 28AUG14-01SEP14 Reservations must be cancelled 30 days prior to arrival. Hotel will be undergoing renovations from 03NOV14-01MAR15 from 9:00am-5:30pm daily. The public areas wil be renovated 100 PCT, guestrooms will receive a 50 PCT renovation. Salsa Brava: Traditional mexican dishes with a twist. Nestled at the foot of Pikes Peak in central Colorado Springs and minutes from the US Olympic Training Center and the US Air Force Academy, the HYHyatt House is conveniently located near many major employers. Colorado SpringsDowtown Colorado Springs offers many restaurants, bars and lounges within walking distance. US Air Force AcademyUS Air Force Academy offers several options from athletic events to their famous chapel. Tours are available.